We all get overwhelmed by out to-do lists every now and then. The tasks keep piling up and there seems to be less time each day. When this happens, I, like many others fall into the bad habit of dreading the to-do list so much that I end up spending more time thinking about all of the tasks I have to do than it would take to just do the tasks. For this month, I’ve decided that I’m going to finish my to-do list, or get pretty close. 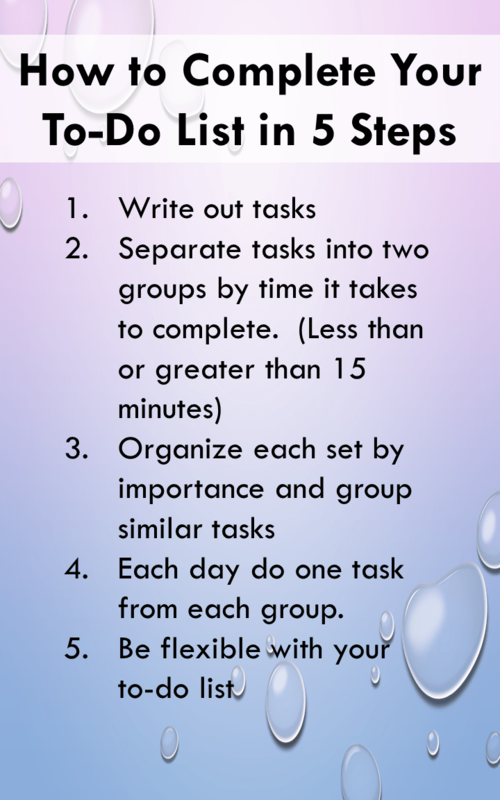 Step 2: Reorganize the tasks into two columns – One column for tasks that take under 15 minutes to complete, and one for tasks that take over 15 minutes to complete. Step 3: Organize each column from most important to least important and combining similar items. There are always things that come up that either need to be added to the to-do list or can take away time from completing items on the to-do list. The most important thing is to be flexible and willing to make adjustments to the to-do list when necessary. If you know you won’t be able to do anything off of the to-do list, plan ahead and do a few extra tasks one day. As long as you are consistently making progress, the to-do list will no longer run your life! I don’t have to write mine down, it is always in my head what I need to do the next day. Probably because I start preparing the night before. Great tips. These are some great tips to help be more productive! Great tips! I like how you’ve organized it by 15 min . That helps with attacking the quicker tasks sooner! Great tips. I like the idea of actually physically separating out the ones that take more & less than 15 minutes. I sort of do that, usually tackle the quick ones first. Great tips! This is really a great way to step by step get through your to do list. Thanks so much for sharing. I’m a HUGE listmaker! They are scattered all over my workspace on random pieces of paper:) I love the idea of breaking out tasks to time investment. I always try to tackle the hardest thing first, but I can see knocking off a few short tasks would get the momentum going! I never thought about splitting the list into two categories! Super smart! Being flexible with my list is something I have to constantly remind myself to do!